Home Tape to DVD / CD Transfer & Conversion. 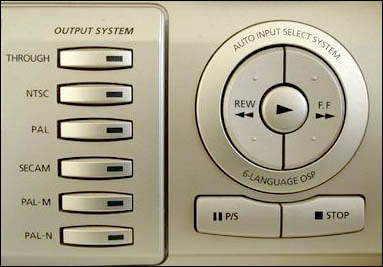 Video & Audio. For same day Video tape to DVD transfers email or call our Orlando Orange County location at (407) 610-2451 for same-day service availability. We provide a full service professional digital transfer and analog conversion services. Our facility offers a complete in-studio service, which includes express analog audio and video to digital format conversion. Great prices and superb service! Same day service on most VHS / VCR, S-VHS, Betacam SP and 8mm / MiniDV camcorder video tape to DVD transfer, audio cassette to CD and DAT digital audio tape conversion orders. Your original materials never leave our transfer facility – everything is done on premises. No outsourcing. Absolute privacy. Your videos are never shared with anyone or uploaded anywhere without your knowledge and consent. We also do not view your videos in their entirety and only sample short footage samples to ensure the quality of the digital transfer. Proprietary DVD video and Audio CD transfer technology and high quality media are utilized to produce DVDs and CDs that last long time. Audio cassette tapes, DAT digital audio tapes and voice recorder microcassette tapes are transferred using a high quality professional audio studio digitizing technology. We also offer audio mastering services if enhancement, restoration and noise removal is required. We thoroughly inspect your tapes and other media before transfer to ensure highest quality digital transfer service. 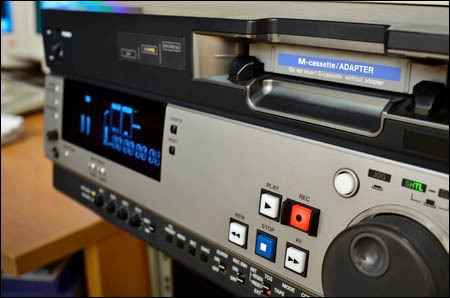 We offer on-site audio cassettes, DAT tapes and video tapes repair service and can fix most common audio and video tape mechanism issues or physical damage. Once repaired, we will recover and transfer your tapes to DVD, CD, DAT or digital files (including MP3 and MP4 formats). Need inexpensive and high quality CD or DVD copies of your audio and video transfers? We offer same-day on-premises DVD and CD duplication services. Interested in making a DVD photo slideshow from your old pictures or digital camcorder files? Check out DVD photo slideshow production service. For vinyl records to CD or MP3 transfer, please visit vinyl records to CD transfer service. For audio and video conversions email or call our Orlando Orange County location at (407) 610-2451 for same-day service availability. We can convert Internationally utilized video formats such as PAL and SECAM signal specifications to digital NTSC format via frame interpolation to produce great results. The digitized PAL video and SECAM data is placed onto an archival grade DVD video disc at standard definition resolution. All International PAL VHS video conversion services are provided on the same day at our facility. Why convert your video to DVD format? DVD Video is the standard format appreciated by professionals and consumers for its ability to preserve the quality of transferred material, provide long shell life, convenience of use and low cost for the features it offers. As long as the proper type of media is used along with professional DVD video transfer equipment, you can expect the results. Storing video and audio on a DVD is an excellent way to protect important information and memories from loss. With high-end analog and digital tape recording currently available, it is unreliable to keep the acquired content on a magnetic medium as it’s susceptible to deterioration from repeated playback and environmental factors such as dust, moisture and temperature variations which eventually render the magnetic tapes unusable. We utilize the highest quality industrial and professionally modified analog to digital DVD, CD and DAT audio conversion equipment on the market. Along with our expertise in digital audio and video transfer field, we are able to produce outstanding and reliable results. What’s the the difference you may ask? The non-professional, consumer grade equipment that is usually used for profit by many tape to CD and DVD conversion facilities (including services from big-box stores) often deliver DVD and CD copies that may seem to work at first. However, a couple of years, months or even weeks later the playback would start deteriorate resulting in skips and freezes that eventually render the DVD and CD copies unusable and not recoverable. Using consumer grade digital transfer equipment results in poor quality audio and video and once the recording is transferred to a digital format, there are no feasible methods to correct or recover poor quality transfers. On the other hand, using professional grade equipment helps to preserve the original footage quality while delivering excellent audio and video transfer quality. 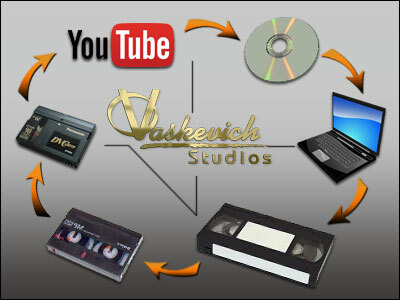 Vaskevich Studios continuously works on improving the digital conversion processes and upgrades the tape and optical media conversion equipment and digital encoding software and hardware as soon as the new technology is available. We have the expertise to provide video transfer services that exceed industry standards by providing quality of transfers and long lasting optical CD and DVD discs. Other outlets not specifically specializing in digital transfer services. Most of the vendors above utilize unprofessional consumer-grade equipment that fails to read the analog and digital tapes properly. Usage of inexpensive bulk CD and DVD media results and transfers that only last very limited time and have significant digital signal dropouts. Furthermore, these vendors monetize on something they do not specialize in, nor they are trained or equipped with to provide high quality digital transfer services. In our experience (as customers come to us to fix media issues acquired from other service providers), over 60%-90% of digital tape transfer services provided by big box stores, pharmacies, package and shipping companies fail to properly transfer tapes, film and video tapes to CD or DVD. People come to us bringing the CDs and DVDs from these vendors that have bad quality of audio and video conversion and optical discs often cannot be even read in CD and DVD players after a couple of years or even months. At times we’re able to recover the lost data, however, most of the time we have to do the digital tape to DVD or CD conversion all over again to get it done properly. Our analog and digital transfer and conversion facility is located in center of Orlando, Florida / Orange County and within a local area from the following cities: Aloma, Altamonte Springs, Apopka, Azalea Park, Azalea Park, Belle Isle, Casselberry, Celebration FL, Clermont, Cloud FL, Cocoa FL, Conway, Conway, Davenport, Doctor Phillips, Eatonville, Edgewood, Fairview Shores, Fairvilla, Fern Park, Forest City, Goldenrod, Holden Heights FL, Kissimmee, Lakeland, Lockhart, Longwood FL, Maitland, Merritt Island and Cocoa Beach, Melbourne, Mims, Oak Ridge, Ocoee, Ocoee, Orlando, Orlovista, Oviedo, Pine Castle, Pine Hills, Port Saint John, Rosemont FL, Sanford, Sky Lake, Titusville FL, Union Park, University Park FL, Windermere FL, Winter Garden, Winter Park, Winter Park and Winter Springs FL.